What The Heck Is A Diurnal? A diurnal sounds like a … uh, uh uh, easy guys, this isn’t toilet humor (pun intended). Actually, diurnal has more than one meaning and we’re not dealing with a daily journal. No, what we will talk about is the diurnal (meteorologically speaking) that means the difference between day and night pertaining to weather temperatures. And in Paso Robles, on the California Central Coast, we have a doozy. In its most basic description, the diurnal is a spread of temperatures relating the highest in one day to the lowest of that same day or within the next 24 hours. For instance, one of the first summers I had here in Paso, we had a high of 106 and a low of 44. That differential was 62 degrees – an amazing temperature swing for 24 hours. And in actuality, it wasn’t even 24 hours as the high was around 4:00 p.m. and the low was about 5:00 a.m. In roughly half a day, the diurnal was 62 degrees. Although this anecdotal example is a bit on the extreme, this huge change isn’t that unusual in Paso Robles, especially during the summer month cycle and is an interesting aspect to the area. In fact, August has highs averaging in the low to mid 90s with lows in the low to mid 50s. June, July, September and October also have wide-ranging diurnals. 50 degree disparity in highs and lows is common fare in summer and early fall. Without going into another entire story on temperatures in Paso, the area lies at the backside of the Coastal Range and typical of many regions in California, the temperatures soar in the late morning through mid afternoons. Sea breezes begin blowing in from the Pacific Ocean, working their way through the mountain passes and dramatically cooling the air – thus, large varying temperatures from night to day. A large diurnal allowed for ranches and orchards, which once dotted the Paso Robles landscape as much as vineyards do now. A slight offshore keeping the marine layer away with warm air aloft during the day and a sun beating down, allows temperatures to climb quickly up. When the late afternoon winds bring in the much cooler air: voila! You have a large diurnal. It should be noted that humid regions and/or areas with bodies of water tend to have a low diurnal. When thinking about moderate diurnals, think Great Lakes region along with the Eastern Seaboard, Gulf Coast and the immediate coastal areas of the Pacific Northwest. They see little change from day to night in temperature swings. Those that live in the desert might know about the large temperature variation or diurnal. The Great Basin (Nevada) has normally huge divergences between high and lows in one day. 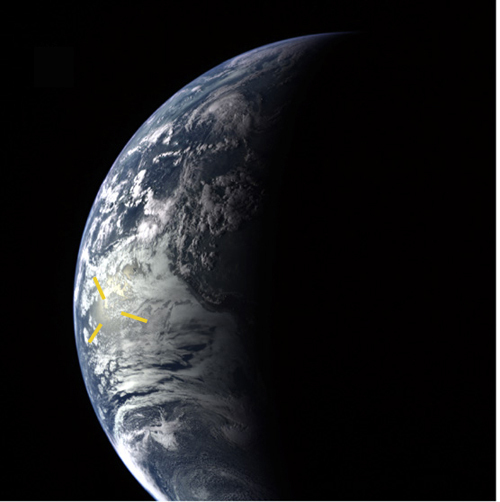 If you look up wide swings in diurnal temperatures, you will inevitably hear about the Upper Plains like the Dakotas also having tremendous climatic variances – due in part to not having any large body of water to moderate the temperature. The continental landlocked plains of the Central Asian Steppe region also has severe temperature fluctuations due to lack of any major body of water. The record diurnal at 100 degrees is held by the small town of Browning, in northwestern Montana (source: National Park Service). 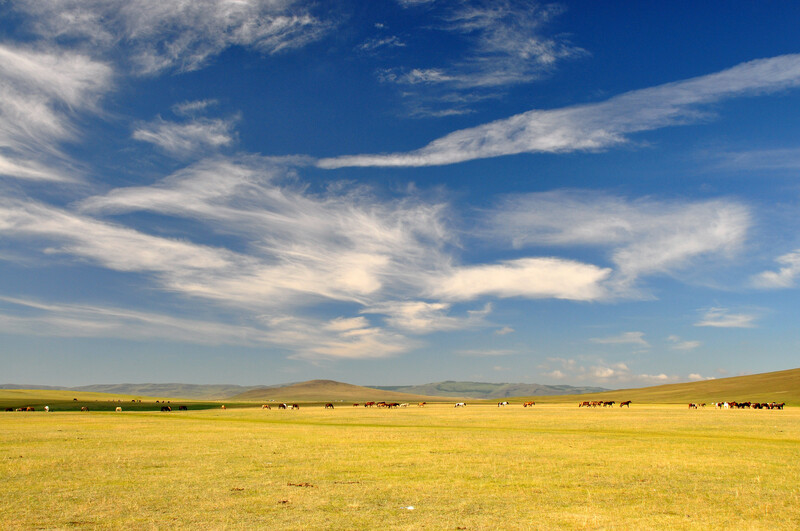 The Mongolian highlands or Steppe region is one of the areas of the world where the diurnal is wide ranging. Breaking the diurnal down inside a day, the greatest change is normally from late afternoon before the sun is low in the sky until just after sunset. Normally here in Paso, it might be 90 in summer on a typical late afternoon around 6:00 p.m. and by 9:00 p.m. it could be 65, possibly changing more than 10 degrees in one hour. By the way, several years ago, shortly after leaving a winery on a blistering hot August day, I looked up on the temperature inside the car and it read 110 degrees outside … and it was 5:30 p.m. And still the lows were in the 50s. 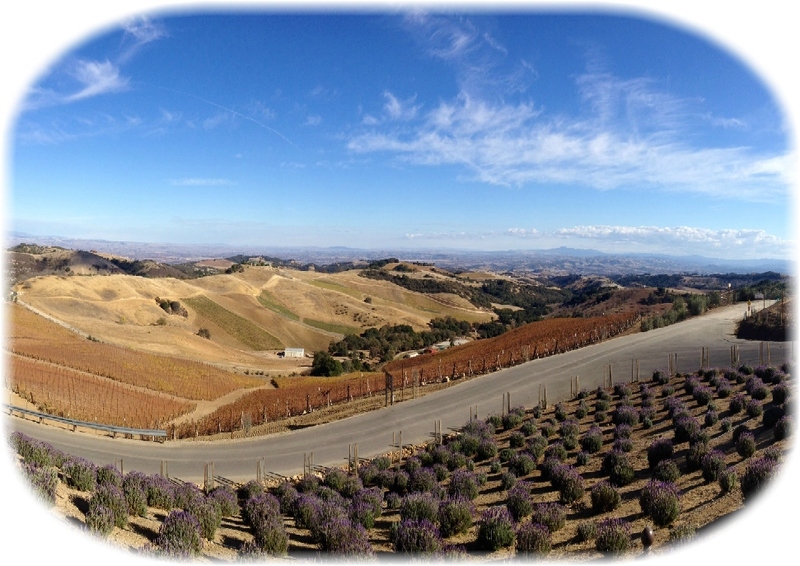 Paso Robles is generally a dry region and the only reason it isn’t a desert more so like the Central Valley – such as Bakersfield (100 miles east) where day time Summer temperatures don’t drop as severely in the evenings – is the effects of the Coastal Range; plus, Paso is only 20 miles from the ocean and the water temperatures blow in to keep it cooler. The lands just southeast of Paso Robles called the Carrizo Plain has quite a divergence between high and lows called a diurnal. This entry was posted in Central Coast, Uncategorized and tagged California, Central Coast, diurnal, Pacific Ocean, Paso Robles, Steppe, temperature, weather on December 19, 2013 by PasoDr. Maybe the largest free outdoor celebration of the year in Paso Robles happens every second Saturday in December with the Vine Street Victorian Christmas Showcase. Thousands gather together on Vine Street between 8th and 21st Streets each Christmas for a huge block party that runs roughly between 6:00 and 9:00 p.m. Numerous homes are magnificently decorated on Vine Street in Paso Robles for the Victorian Christmas Showcase. The homes, churches and even some businesses are lit up for an illuminating extravaganza that probably makes the power company more than happy. People stroll along on both sides of the street, stopping occasionally to listen to carolers or any other assortment of live entertainment. Much like Pioneer Day in October, the city and a few other associations put on the gathering and again, it’s free to one and all. 2014 will mark the 28th annual Vine Street Victorian Christmas Showcase. With such an enormous amount of people in one place, for safety reasons, there are no cars or pets allowed. A parade starts the festivities and bring your walking shoes plus, as usual, bundle up with clothes because Paso Robles’ evenings are brisk (figure on temps in the 40s although in can dip into the 30s). Free hot chocolate and cider are along the route to help keep you warm and many other free foods are available. Christmas is quite a magical time in Paso, so come out and enjoy enchanting holiday fun. 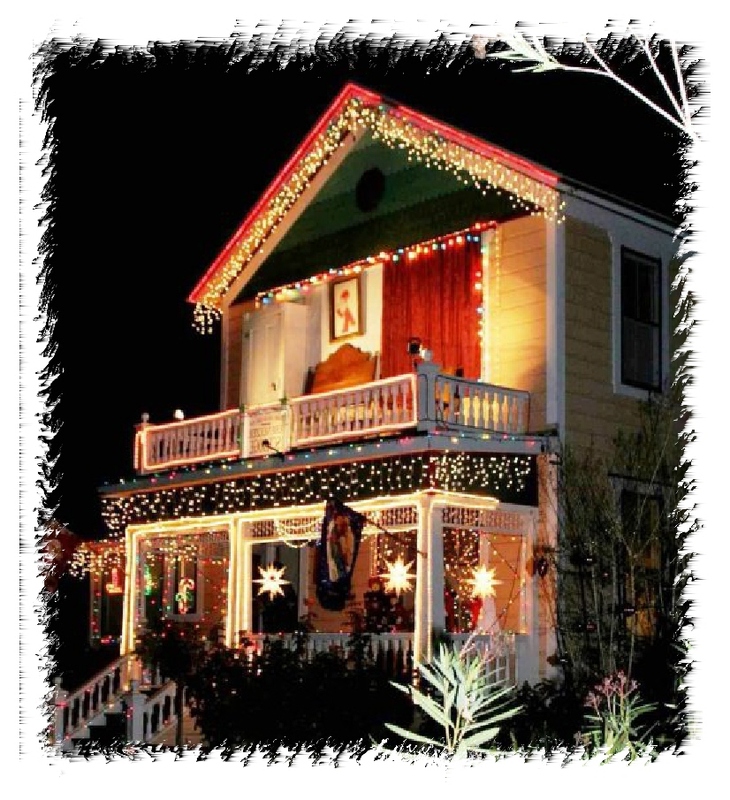 This entry was posted in Central Coast and tagged block party, Christmas, Paso Robles, Vine Street Victorian Christmas Showcase on December 12, 2013 by PasoDr. This might be the Wine Region of the World, but even in a paradise like the Central Coast of California, there are tribulations that can threaten the livelihoods of its citizens. It appears the water problems with Paso Robles are set to be managed. According to the Paso Robles Agricultural Alliance for Groundwater Solutions (PRAAGS), they’ve proposed a special water district be formed to manage the ground water basin. Elections would be required. Go here for more on the latest from PRAAGS. As was mentioned in the last post on this subject, a combination of a semi-arid region, drought, an escalation in the population along with huge growth in farming (wineries), has left the ground water levels dangerously low. However, politics has tried to rear its ugly head and create a situation that could turn into a quagmire. The San Luis Obispo County Board of Supervisors instituted a temporary ordinance (initially 45 days, but now two years) that required any pumping of groundwater for new crops had to be offset by an equal amount of watering of other crops turned off – a ruling called the 1-1 ratio. Now is seems all sides are willing to come to the table to stabilize the water problems, but the sticking point may be simply: Who will be in charge? That’s what Cindy Steinbeck of Protect Our Water Rights (POWR) has presented. Steinbeck representing a group of local farmers, sued the county to retain their water rights under California law – it’s more complicated than that – so that there can be an equitable and fair agreement for all concerned. In its simplest form, POWR wants the courts to decide how the administrating of this new water district works rather than a political agency. Go here for her latest on the management of a new district. What does all this mean? As I’ve said many times, I’m not someone who can come up with the proper answers, but I do know that using our water issues as a political football is wrong. I would suggest other regions with similar situations arising due to their growth in the wine business, be aware and attentive of this kind of problem – especially in California or other areas with a semi-arid climate and limited water. Agreements can be made by all sides but making politics out of this issue needs to be kept at bay … I hope. This entry was posted in Central Coast, Water and tagged California Central Coast, Cindy Steinbeck, Paso Robles Water Problem, PRAAGS, San Luis Obispo County on December 9, 2013 by PasoDr. The most common oak used (almost exclusively) in the making of wine is wood from the oak tree. Whether from North America or Europe, almost all wine barrels are made from the hardwood oak. In America, the White Oak is the wood of choice for making wine barrels. Why? The simple answer is the binding of the grains in the oak is tighter than most other trees and in the matter of the White Oak (technically quercus alba), the flavors given off by the wood compliment wine better than any other. Commonly you’ll hear that a new barrel gives off a spicy vanilla flavor to the wine, which is like seasoning the wine. Given its tight grain structure and density, the White Oak’s wood is essentially resistant to rot, making it a great product for wine barrels and furniture use in or out of a home or business. First off, anyone who says they know exactly how many barrels are sold and where they come from is either not telling the truth or it’s an estimated guess. Regardless, French oak makes up nearly two-thirds of all wine barrels produced. North American oak (mostly from the United States) makes up nearly one-third of wine barrel production worldwide. Note: a small percentage of oak comes from Eastern Europe. The main difference between the oaks of Europe and the United States is the tightness of the grains. French are tighter and thereby don’t offer quite as much flavor as American. That’s not necessarily a good or bad distinction between the two, but actually offers a winemaker a choice of what he wants the barrel to impart with the wine. Though French oak have higher tannins than American, the still high tannin content influences aromas and flavors. In addition, the bark is used for medicinal purposes such as treating inflammation along with a variety of ailments. Usually found in lower elevations, the slow-developing White Oak generally grows throughout the eastern half of the United States and is the country’s national tree. Not to be confused with its close cousins the Bur Oak or Swamp White Oak, which maybe is a bit darker, the bark of a white oak is an ashen color. A popular food for an assortment of birds and mammals, their rather large acorns mature quickly compared to most other oaks (within six months) and the tree is not evergreen but deciduous, meaning it loses it leaves every year. There is an exception to losing it leaves and that’s the fact younger White Oaks can hold onto their leaves through winter, offering additional protection for many different types of birds. 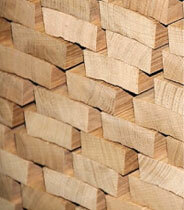 A stack of staves before being assembled into a wine barrel. It’s not unusual for a cooperage (where they make barrels) to use the oak from diverse areas of the country but in any case the Midwest is the most popular region for producing wine barrel quality trees. The state of Missouri is probably the most common producer of White Oak used in American wine barrel making. By the way, the central part of France is where a majority of wine barrel wood comes from with the government controlling nearly all those forests. With dark green leaves that turn a dark reddish hue in the fall, White Oaks grow almost as wide as they grow tall and with its lighter than normal bark, they are regal in the way they stand out. When the hardwood is cut to make barrels, the wood is light in color, but turns a pale yellow when dried. The hardwood from these trees is excellent material for a multitude of uses including floors, beams and railroad ties. 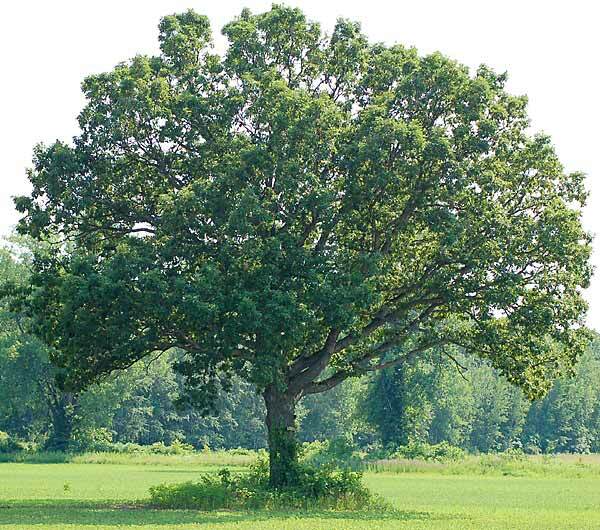 Left alone, a White Oak may live up to 500 years and grow to 100 feet – both up and across. 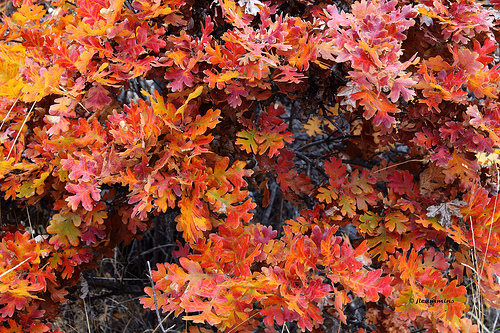 The leaves on a White Oak can turn a dark red color in the fall. Oddly enough, a vast majority of wine is not stored in wooden barrels at all, but instead is stored in giant steel casks. Still, the art of making wine in oak barrels consistently produces the best wines. And the White Oak is a key source of what makes those wines as good as they are. If you were to look up the most expensive wines, you would find they all received their start in an oak barrel. While the French oak is more subtle and popular in its use than American, the White Oak ads a character all its own and can make wines more robust. This entry was posted in Barrels +, Wine and tagged French Oak, tannin, White Oak, wine barrel on December 5, 2013 by PasoDr. Here we’ve combined the very early years of Paso Robles with the establishing era and then more recent developing times to give you a small picture into the history of Paso Robles. Paso Robles has an interesting past on the American frontier and makes the current period all that more amazing when you consider the Paso Robles AVA is now the world’s top Wine Region of the Year. 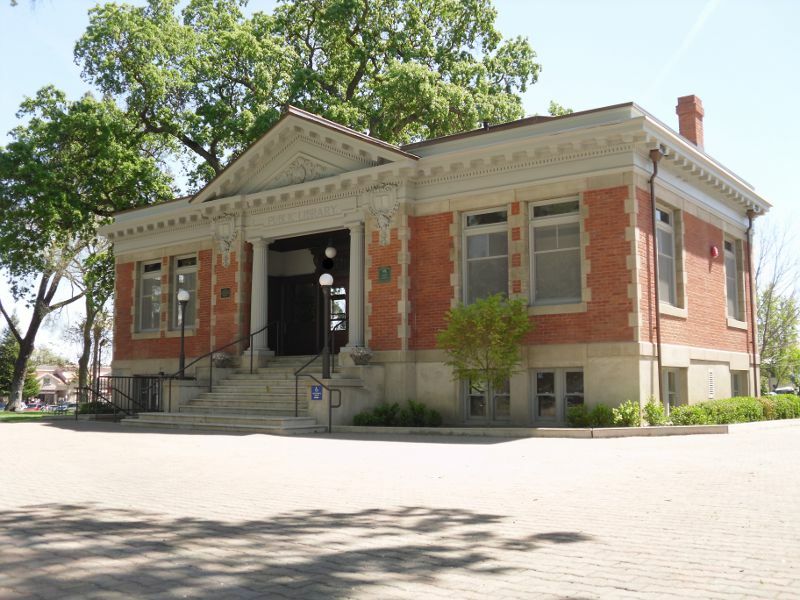 I should note that the Paso Robles’ Library is a museum of sorts and has an incredible wealth of information pertaining to the town and its history. Some folks asked where the rest of the history was because they would read just one section of our three-parter – so here they are spliced together. Just click on the story headline for the full period rundown of each of the three eras. This entry was posted in Central Coast and tagged Paso Robles AVA, Paso Robles History, Paso Robles Library, Wine Region of the Year on December 1, 2013 by PasoDr.